On the 29th and 30th of September 2014 the Deputy Director of the Directorate for Political Council of the Council of Europe, Mr Daniil Khoshabo, and Political Advisors Mr Maxime Longangue, and Mr Marsel Capi paid a visit to Georgia. 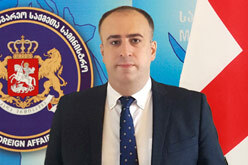 Within the framework of this visit the aim of which is to prepare the Council of Europe Secretary General's 10th consolidated report on the conflict in Georgia, a meeting was held with the Georgian First Deputy Foreign Minister, Mr Davit Zalkaliani. Discussions focused on the situation in Georgia's occupied territories and the importance of the Council of Europe Secretary General's consolidated report, as well as on the current developments in the worlds and issues relating to regional security.